These pumpkin oat muffins are packed with good things like protein and fibre without compromising taste. Perfect on-the-go breakfast option or mid-afternoon snack! Do you love pumpkin season as much as I do? As soon as it turns to fall, I crave anything PUMPKIN. Now muffins, they’re something I usually stay away from. Delicious, yes. But they’re usually packed with sugar and oil. Those are two things I’m trying to stay away from these days. But, don’t worry. 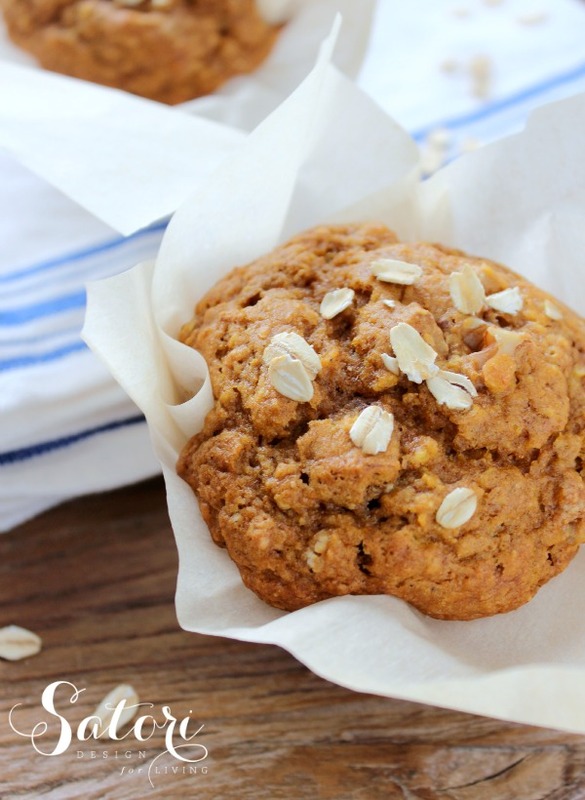 These pumpkin oat muffins are so moist and flavourful. You can thank the pumpkin puree and spices like cinnamon, nutmeg and ginger for that. Perhaps it’s okay to indulge in muffins once in a while if they’re the right ones, right? Try these pumpkin oat muffins packed with good things like protein and fibre. So delicious! Preheat oven to 375°F. Line a muffin tin with parchment paper or ready-made liners. In a large bowl, mix the dry ingredients together. In a separate bowl or large measuring cup, combine the wet ingredients. Pour the wet mixture into the dry and stir until just combined. Scoop the batter into the prepared muffin tin and sprinkle top with rolled oats. Bake for 20 minutes or until golden brown. These muffins freeze well in an airtight container or plastic bag. 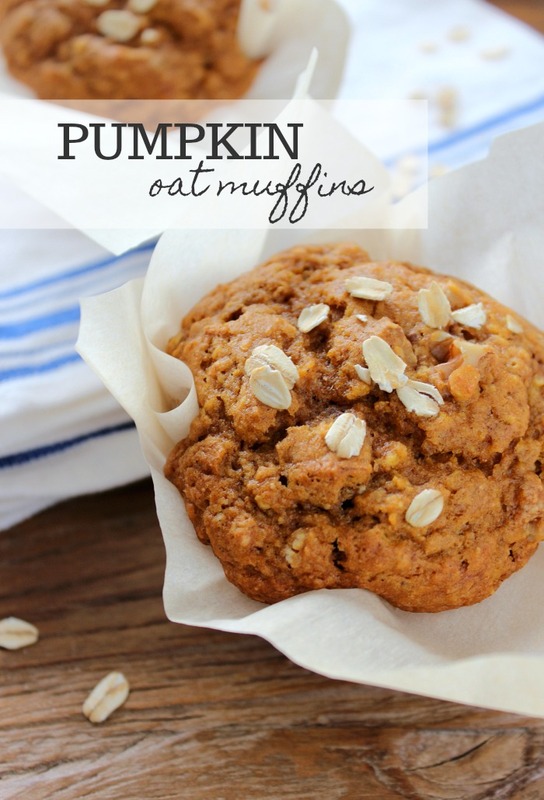 PIN this pumpkin oat muffin recipe for later! Have a favourite fall flavour? Do you go nuts for pumpkin like I do? « The Satori Blog Turns 3! These look amazing!! Pinning so I can bake them on the weekend. Thanks for stopping by, Katie! The weekends are when I do most of my baking too. Happy Fall! I like to do a double batch and pop them in the deep freeze for busy days. Let me know how they turn out! These look delish, I love hearty fall flavors, especially with oatmeal, yum! This looks like a great recipe. Love that you made those healthy substitutions. I’ll have to give this one a try. I’ve never made pumpkin muffins, but I’m going to attempt these for Sunday morning. Thanks for sharing! Visiting from Link Party Palooza. Pumpkin, oats, how delicious! I co-host Sweet and Savoury Sunday and would love for you to stop by and share this and other recipes with us when the party goes live this Sunday. Have a great day! Yummmmmm! That does look good Shauna, thank you! Shauna I only make three kinds of muffins and one of them is pumpkin too! Same reason, they kinda need to be healthy plus everyone needs to like and eat them. I love that your recipe uses coconut oil since I have a costco sized vat of it in the cupboard…need more ways to use it up! Thanks for sharing! I made these this afternoon with my five year old. We had one for dessert tonight. Kids and parents loved them. I love that they aren’t super sweet, but still super tasty. My husband counts calories and figured these were about 130 calories each, pretty good. These will go in the snack/lunch bags tomorrow. Thanks! So glad to hear! Everyone loves them around here too!